Discussions Magazine Music Blog: WIDESPREAD PANIC/Dirty Side Down: Available on May 25th, 2010! WIDESPREAD PANIC/Dirty Side Down: Available on May 25th, 2010! New York, NY – Dirty Side Down, the 11th studio album from Widespread Panic is set for a May 25th release on ATO Records. Dirty Side Down is comprised of 12 songs that incorporate Panic’s unique blend of rock, jazz and blues inspired textures into songs flowing with melody, rhythm and emotion. After 24 years, Widespread Panic remain one of America’s best live bands, and most successful touring acts. Aside from their legendary live shows, they continue to raise the bar in their genre through their songwriting, and Dirty Side Down is a prime example. Band members John Bell (vocals/guitar), John Herman (keyboards/vocals), Jimmy Herring (lead guitar), Todd Nance (drums/vocals), Domingo Ortiz (percussion) and Dave Schools (bass/vocals) combine their efforts by writing, or co-writing, 10 of the album’s 12 tracks. 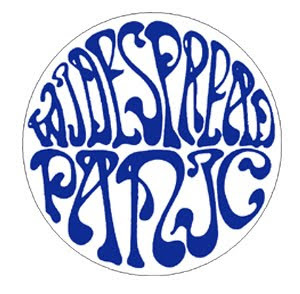 Songs, such as the dark, multi-layered opener “Saint Ex”, the boogie blues of “Jaded Tourist” or the laid back Southern nature of “When You Comin” home showcase Widespread Panic’s dynamic range as songwriters and musicians. One of the highlights of Dirty Side Down is the hauntingly beautiful cover of “This Cruel Thing” written by the late Vic Chesnutt, whose songs the band has recorded and performed for years. Widespread Panic has previously collaborated with Chesnutt on two albums under the name Brute. "I guess Widespread Panic and Vic aren't quite done with each other yet. ", says Panic lead singer John Bell. Dirty Side Down was produced John Keane along with Widespread Panic. Keane also engineered, mixed and mastered the album, as well as contributed pedal steel and acoustic guitar.